This CD is the second from the Aevea label to come to this reviewer. The first was a 3 CD set of piano works by Satie which you can find on this web site. Aevea is a sub-label of OnClassical and is distributed in Canada and the USA by Naxos of America (NOA). Aevea/OnClassical is based in Italy and offers their music in several formats; CD, MP3, WAV, Flac 88.2/24 and 176.4/24 however NOA does not offer the Flac format. You can read more about OnClassical in the article published by Nick Whetstone in 2009. The recording provided to us for this review was in WAV format. The recording quality is excellent, the piano shines with clarity and depth of tone. Maurizio Zaccaria has a clean and controlled touch on the keyboard. When researching George Gershwin's musical style, one tends to find the words "jazz, blues and ragtime". Authors very often use these words when describing the main influences on Gershwin's music. These influences are of course much more present in his songs and compositions destined for Broadway musicals than in his classical compositions. However even in the classical works one can still find some of the jazz influence. All of the "Songbook" tracks on this album tended to illicit the same thoughts from this reviewer; missing the jazz/blues feel and the left-hand swing, blues progressions don't sound like the blues, not the way someone brought up listening to the blues would play it. 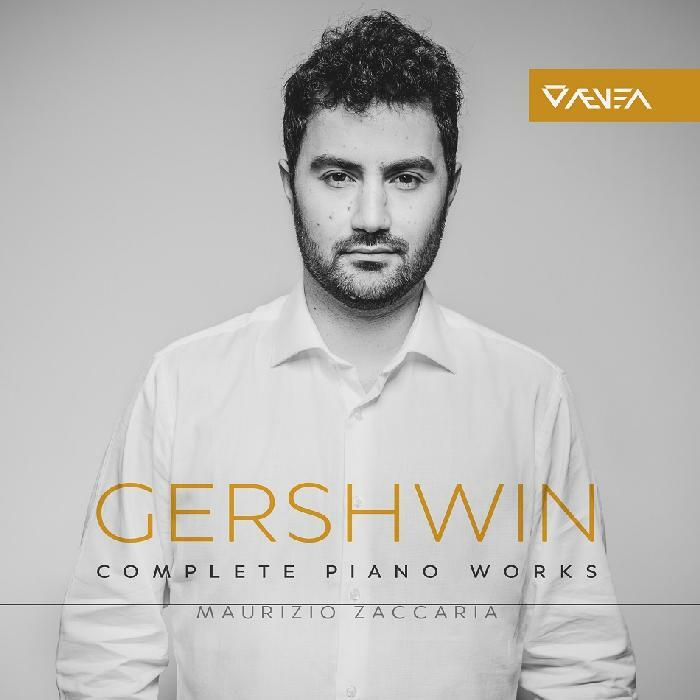 This may reflect the pianist's intent, but it's difficult to imagine that it was Gershwin's intent. Track 11, Oh Lady be Good, totally misses the mark. It doesn't sound like Gershwin's music! On track 14, Impromptu in 2 Keys, the left hand playing should set the a swing rhythm for the piece but its not there at all. Same for track 16, the stride isn't there. Track 17, 3 Preludes, was clearly written with a jazzy feel, in this version it has been denatured and put into a classical frame. Some of the slower tracks, for example Track 9, "The Man I Love" have more feeling and come the closest to the Gershwin style. The Zaccaria playing of Rhapsody in Blue is quite interesting as the musician's skill, precision and delicate even romantic touch shine. From my hand-written review notes; "too perfect". There is a bit more swing to it than many of his other pieces. It still has somewhat of a classical music feel to it at times. The Gershwin version has more drama or tension and of course more tendency towards a swing feel. 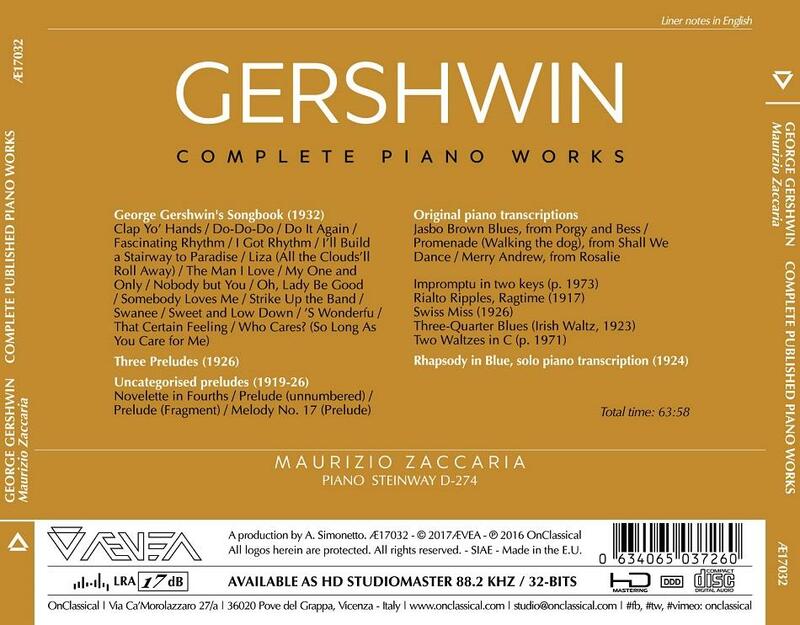 Gershwin version playing time is 14:25 vs Zaccaria 13:25. On Sweet and Low Gershwin plays with a swinging left hand; a short left-hand run leaves the image of Fred Astaire skipping down some stairs. The Zaccaria version is much slower to the point where it loses the swing, the left hand run becomes bumpy, like stumbling down stairs. On Swanee the Zaccaria version doesn't have the swing of the Gershwin version. Jazz has been very popular in Europe for over 70 years, One might expect that this recording would tap into Gershwin's jazz roots however, whether intentional or not, this doesn't happen. Much of the music sounds like it was read as if it was Chopin, not music rooted in early American jazz. That being said, the recording quality is excellent as is usually the case with Aevea releases and Zaccaria's playing of the classical tracks is well done. The most interesting piece for this reviewer was the Rhapsody in Blue because of the skilled touch and sometimes romantic playing.